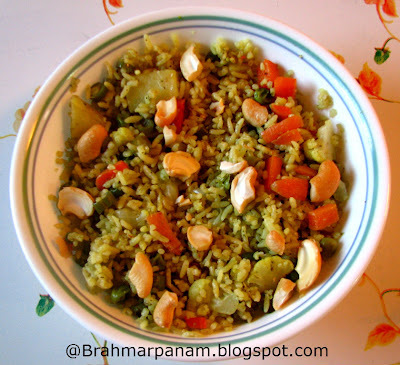 The Vegetable Pulao is a one dish meal and very easy to make. I have used only carrots, beans, potatoes and cauliflower in this recipe. But you may add or subtract the veggies to suit your taste. This recipe serves 4. Heat 1 tsp of Ghee is a pan, fry the Cashews and Raisins and keep them aside. Heat the remaining Ghee/Oil in a thick bottomed vessel / Cooker and add the Bay leaf, Asafoetida and Cumin seeds. When the Cumin seeds start crackling, add the Ground paste and fry it till the oil separates from it. Now add the Vegetables, Turmeric powder, Chilli powder and Coriander powder and mix everything well. Wash the Rice and add it along with 4 cups of Water and Salt. Stir well and simmer the stove. Add the fried Cashews and Raisins to the Vegetable Pulao and serve hot with a Raita.